This week’s focus for National Nutrition Month® is how I make snacking healthy AND tasty. I wanted to first share a quote with you that I ran across the other day. I’m not sure who wrote the quote but it really resonated with me and I thought it rang true to how eating right should be. “Nutrition is not low-fat, it’s not low-calorie. It’s not being hungry and feeling deprived. It’s nourishing your body with real, whole foods so that you are consistently satisfied and energized to live life to the fullest. After all, isn’t that what this life is about?” I hope this helps you better understand the true simplicity of nutrition. Now let’s move on to the topic of snacking. In my life, snacking has really transformed into something much more than just food between meals. It’s a way that I get more vitamins and minerals in my diet, a way to keep my brain awake and active (I do have a 1 year old so I’m usually sleep deprived), a way to control my hunger, and a way to stay energized. As you will come to realize through reading my blog entries, eating right takes preparation and snacking is no exception. I almost always throw a couple snacks in my purse before heading out the door in the morning. That way, I’m always prepared when hunger strikes and I’m not as temped to go to the vending machine and grab a bag of chips. My favorite snacks are apples (I probably eat one every day), low-fat string cheese, homemade hummus with whole wheat pita bread or carrot sticks, mixed nuts or plain almonds, a spinach side salad, banana with a spoon full of natural peanut butter, and even a small serving of dinner left-overs. Many times I get the impression that people who are trying to “snack healthy” eat things like rice cakes, celery sticks and diet snack bars…it doesn’t have to be that boring! How do you snack healthy? Don’t forget to join NCHPAD’s taste challenge this month by sharing your yummy meal ideas and tips on Facebook and Twitter. Just add the hash tag #NCHPADtastechallenge and the person with the tastiest idea will be featured in my blog at the end of March. Source: Academy of Nutrition and Dietetics. 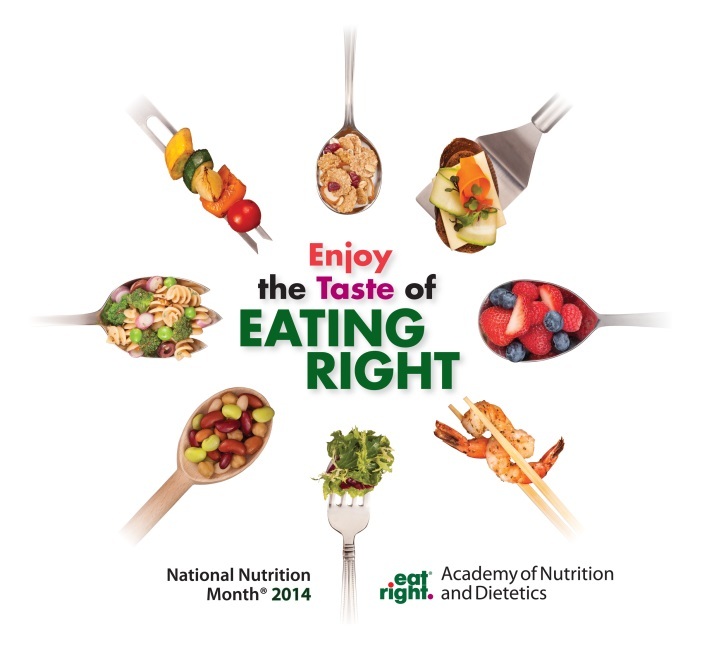 National Nutrition Month®, 2014. http://www.eatright.org/nnm/. Accessed March 6, 2014. With the exclusion of celery sticks you just nailed my snack menu. The interesting part is that I am still always hungry. At times I feel that my snacking needs to include more food just to curb the appetite. Also, with my workout schedule I feel that I have to calorie load so that I do not burnout during my workout. Thank you for the suggested snack ideas. I can now add to my menu. For your workout days, instead of calorie loading beforehand (which may not give your body what it needs), try to snack on complex carbohydrates which is going to be your main energy source (whole wheat bread, oatmeal, beans, starchy veggies like potatoes). And during a long workout, your body will switch from using the carbs to using fat stores. But don’t load up on fat; research has shown that high-fat or low-fat diets aren’t beneficial in enhancing endurance athlete performance. You will want a little bit of protein in your snack before a workout because your body can convert amino acids into glucose when you start to run low (snack option would be whole grain tortilla with turkey and veggies). You may also need to refuel during a workout if you are finding that you fatigue before you’re done. You could try sports gels or sports drinks. Don’t forget to stay hydrated too. And you want to have a snack within 30 minutes of finishing your workout (complex carbs and a little protein). This will help to expand your bodies glycogen storage capabilities making your body more efficient when exercising. Sorry for all the info!